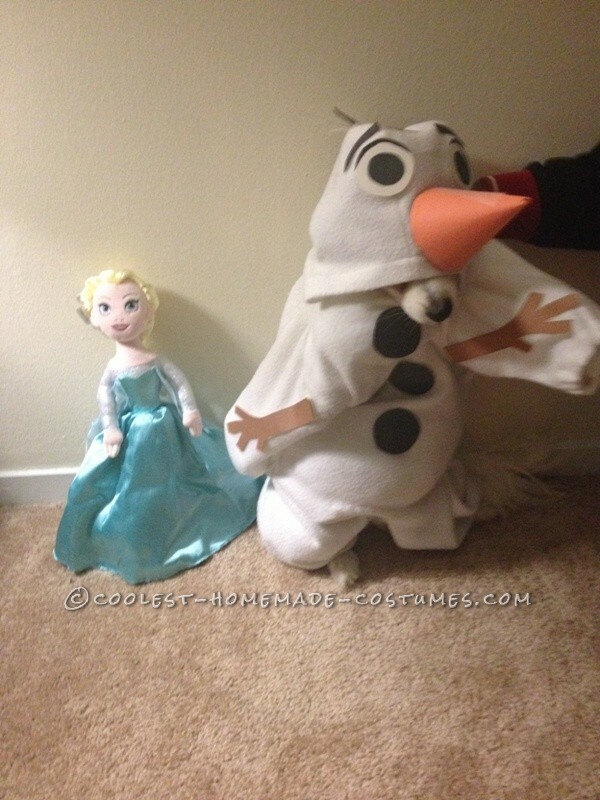 The Mask Costume – Super Easy! I am a special education teacher and my students are always talking about the movie Frozen. 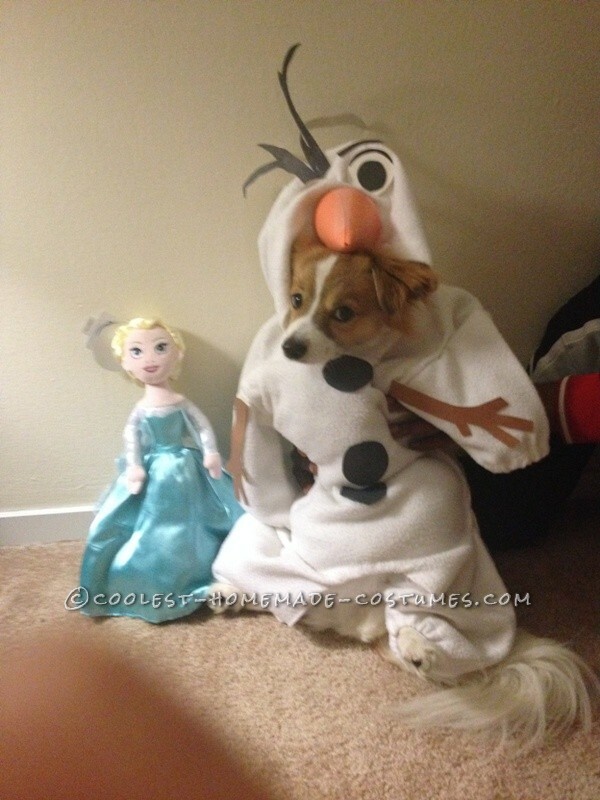 That is how I came up with the idea to make the costume of Olaf for my dog Mochi. I went to the thrift shop looking for ideas of how to make the costume. I found a white one piece baby’s outfit. This was the start of the greatest costume idea of all time! My mind started turning. First, I put it on Mochi to see if it fit. It was huge on him; more like a bag than an outfit. He quickly squirmed out of the outfit. I took out my needle and thread and started sewing. I put it back on Mochi and it turns out my sewing skills are not up to par because the thread came out! I tried for a second attempt. I put it back on him and it was a good fit. He was unable to squirm his way out of the outfit. It was a success! I used cardboard to make his eyes, arms, eyebrows, nose, hair, and buttons. I used construction paper for arms, nose, eyes, and buttons.I colored the hair with a marker. To me it was all coming together. Next I hot glues them onto the outfit. I called Mochi and he ran away from me around the house trying to avoid the inevitable! 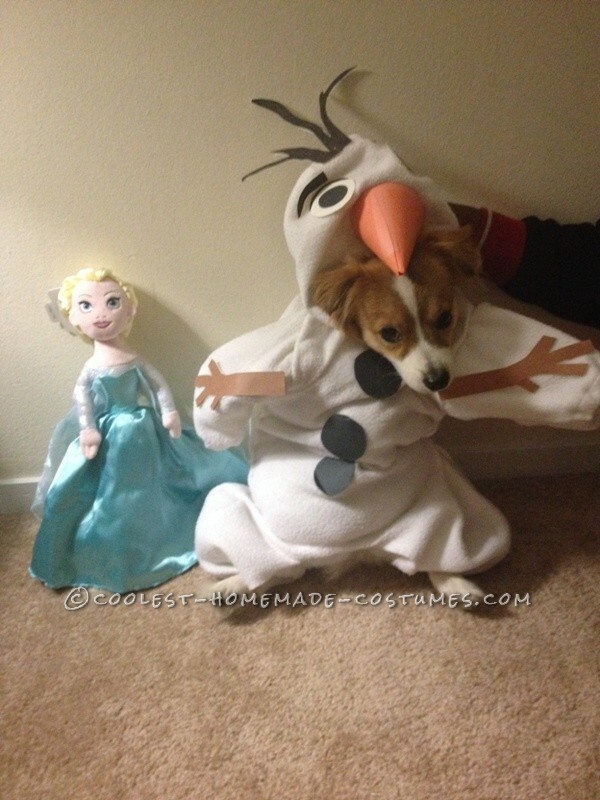 I got him and put him into the costume. 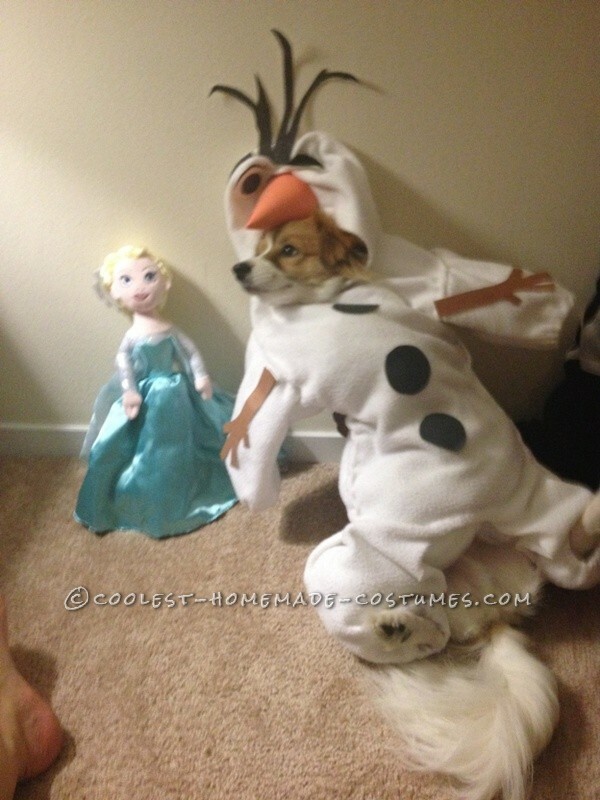 Next, I filled it with pillow stuffing to make Olaf look “fuller” like a real snowman. I got an Elsa doll and began taking pictures! He was not trying to sit still thus taking lots of photos. Each time I tried to adjust the costume I couldn’t help but laugh at how funny he looked and the look he was giving me, “Mom, hurry up, I want to GET OUT OF THIS!!”. When I was finished, I gave him some treats for being a great dog.